Finance 101: Lemonade Stand, Inc.
We live in a world of high finance. We don’t necessarily have to enjoy it, but it’s useful to understand it. Not because you’re likely to jump careers from engineering to corporate finance (although you certainly could), but because the world of leveraged buyouts and P/E ratios is likely to affect you personally. Whenever your employer offers you stock options, your startup goes public, or you pick investments for your retirement plan, it’s better to know a least a little something about what’s going on. Let’s dip a toe into the shark-infested waters of corporate finance, shall we? Bankers and investors have their own jargon, just like engineers do. Right off the bat, that makes their conversations hard to follow, and it makes the financial of schematics and flowcharts inscrutable to outsiders. That incomprehensibility might be somewhat deliberate. Like ancient priests and shamans, financial professionals protect their careers by convincing laypeople that they have special, arcane knowledge unknown to the rest of us. We’ll see. Let’s say you want to start a small business: an actual, literal, lemonade stand. You knock together a couple of old wooden boards, swipe some lemons from your neighbor’s tree, stir in sugar from the kitchen, and dilute it all with water from the garden hose. Voila! In less than an hour, you’ve set up a thriving retail business on the sidewalk. Congratulations, you’re on your way. Business is good. The weather is hot, there’s plenty of foot traffic on your street, and your prices are right. You quickly sell out the day’s allotment of lemonade and pocket a tidy profit (especially considering it cost you nothing to get started). Sleep well, for tomorrow is another day. Before you drift off, you count your loot. All the money you collected from your customers is your revenue, or gross revenue, or sometimes just the “gross” – all three terms are synonymous. Any money you had to spend that day are your expenses. In your case, there weren’t any expenses at all. Finally, the money left over after paying expenses (none, in this case) is the profit, also called the “net” or “earnings.” In utterly simple arithmetic terms, revenue – expenses = profit. Day Two unfolds much like the day before, except that your neighbor’s tree is almost out of lemons and the water from the hose tastes funny. You still sell all your lemonade, but it looks like you won’t be able to continue this way much longer. Something’s gotta change or you’ll be out of business after just two and a half days. Time to raise some more money. It looks like you’ll need to start buying lemons instead of stealing them, and you’ll need a better supply of water. Oh, and the household sugar will run out soon, so you’ll need to secure a steady supply of that, too. And more paper cups. While you’re at it, it might be nice to upgrade the old wooden stand. Bugs and splinters are bad for business. The second option is to cajole a friend into lending you the money. If your friends are rich and beneficent, they’re called “angel investors.” These are basically people who take a personal interest in your business and lend you some of their own money. Angels are basically solo VCs (below). Third, you can get a normal loan from a bank. The bank will charge interest, of course, and they’ll also want something as collateral. Since your lemonade stand is only two days old and, frankly, isn’t worth much, they’ll likely be unimpressed. You may need to put up something else, like your car, as collateral. But at least loans are safe and well-understood, and the bank won’t take away part of your business unless you default on the loan. Moving on now to the more exotic options, you could make a trip to Sand Hill Road in Menlo Park to get some VC money. Venture-capital (“VC”) firms are like small banks but more aggressive. They’re willing to take on riskier deals than a bank typically would. Many VC firms specialize in funding specific types of new businesses, like software startups, or biotech, or SoC developers. You show the VCs your PowerPoint slides, and maybe they give you some money. Well, they never actually “give” you money, nor do they lend it like a bank. Instead, the VCs take a share of your company – and this is where it gets tricky. Instead of taking a loan and paying it back with interest, you’ll be taking VC money and giving them part of your business in return. How much of your business? It depends. Let’s say you sell lemonade for $1 per cup, and you sell 100 cups per day. (Your neighborhood prides itself on working in nice round numbers. Even the street addresses all end in 00.) That’s $100/day in gross revenue. Minus expenses, that’s still $100/day net, but you know you can’t keep that up because you’re soon going to have to start paying for the lemons, the sugar, the water, and the cups. So… you estimate that you’ll spend about $15 per day on all that stuff, for a net profit of about $85/day. That $85/day (or $0.85 per cup) is your profit; your profit margin is 85 percent. That’s a good business. Everything’s fine. During your razzle-dazzle PowerPoint pitch, you tell the VCs that you can make $85/day all day long, but only during the summer months. Nobody will buy your lemonade in winter, so you figure you’ve got about 200 good selling days per year, for a total of $17,000 profit per annum. Sound good? Where can I pick up my check? The steely-eyed VCs across the table are impressed with your enthusiasm, your business acumen, and your preparation. (“He even used original clipart!”) But they worry: what if the weather turns bad and you can’t stay open 200 days each year? What if there’s an unseasonal frost in Mexico and the lemon crop fails? What if sugar prices go up drastically, cutting into your profits? But most of all: what are you doing to prevent competition? Do you have any patents? Uh, no. You haven’t applied for patents on your process for making lemonade, nor have you trademarked your company name, copyrighted any slogans, or kept the recipe a trade secret. In fact, you’ve done just the opposite: “It’s all natural – just lemons, sugar, and water, like Mom used to make!” The VCs are worried that there are no “barriers to entry” in your business. There are no hurdles to prevent your next-door neighbor from setting up a competing lemonade stand with substantially the same ingredients, the same recipe, and the same market territory. You are undifferentiated. There is no USP: no unique selling proposition. It’s not looking good. Still, these VCs are optimistic about the lemonade market overall, and you’re not the worst lemonade pitcher (ahem) they’ve seen this month, or even this week. It seems everyone wants to get into this business, but you’ve got a first-mover advantage. In other words, you’re early and you’ve already got a product that works. You just need help growing it. So, what about that money? The VCs agree to hand over $10,000, in exchange for 30% control of your company. That means you and they will be 70/30 owners of “your” lemonade stand, starting now. What does that mean to you, and how did they arrive at those numbers? VCs perform a mysterious ritual called “valuation,” in which they try to place a price tag on your company. Normally, that involves looking at your daily, monthly, or annual revenue, subtracting out your expenses, and projecting the profit margin forward a few years. Then, they stir in the effects of your competition, adjust for expected changes in market demand, correct for inflation, add in some eye of newt and tongue of bat, and come up with a valuation. “Your company is worth… $35,000.” In your case, that’s about equal to two years’ worth of profits. You have a valuation of $35K and a “multiple” of 2x, meaning the valuation is twice your annual earnings. A multiple is simply a financier’s rule of thumb for placing a valuation on a company. It’s a scaling factor; a coefficient. Different types of businesses get different multiples. For example, EDA companies (Synopsys, Cadence, Mentor, et al.) tend to get fairly low multiples equal to about 2–3 years of their profits. Chipmaking companies generally get higher multiples, and some software companies have very high multiples, equal to ten years or more of sustained profit. The multiple is meant to reflect the profit-making potential of the company and other companies like it. Having a low multiple doesn’t mean that you’re running a bad business, only that the VCs think your growth curve won’t be as steep as someone else’s. With their $35K valuation, the VCs are saying that they, or someone else, could buy your lemonade stand and everything associated with it for $35K. That’s assuming you wish to sell it, of course. It’s not a legally binding estimate, and you’re welcome to approach other VC firms and get different (hopefully higher) valuations elsewhere. That valuation also implies that the $10K they’re offering you is about 30% of what the entire company is worth, making them part owners of your business. There are two side effects to this. One, the VCs may get to stick their noses into your day-to-day business operations. They might recommend that you buy lemons from Florida instead of Mexico, or they may suggest offering a zero-calorie lemonade alongside your normal product. The VC’s participation might be extremely helpful, or it might be unwanted meddling in your business. It all depends on the VC you work with and your attitude toward management. The best VCs are truly partners, and both sides prosper. The second effect – and the whole point of the exercise for the VC – is that they get 30% of money when you eventually sell the company. They’re betting that if they put in $10K now, they’ll get back $30K, or $50K, or $100K or more down the road. Most VCs won’t invest unless they think they’ll get at least triple their money back, and quickly. They want your business to grow, and they’ll do whatever they can to help make that happen. They’re in it for the money, remember, and your lemonade stand is a means to that end. Which brings us to the final financing option: raising money with a public offering. As with the VC option, you’ll be exchanging a portion of your company for cash. With a VC firm, you’re selling one big chunk of your company to one investor. When you “go public,” on the other hand, you’re selling millions of tiny portions to millions of different investors. For most small companies, going public is the ultimate endgame. It’s the goal, the Blessed Event, and the pot of gold at the end of the startup rainbow. 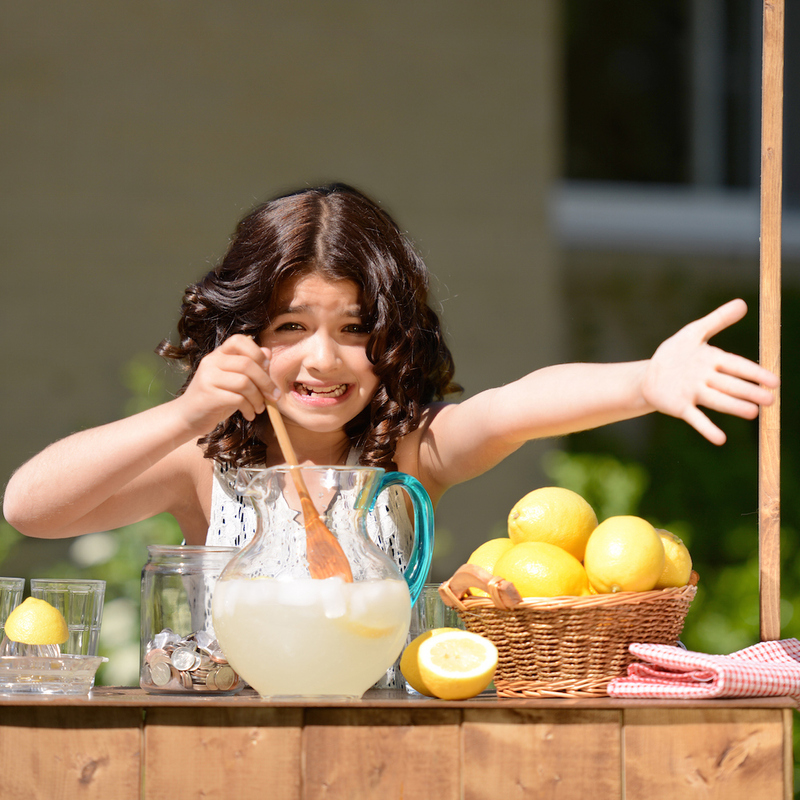 An IPO (“initial public offering”) is a big one-day sale of company ownership and the start of a new chapter in your lemonade stand’s future. It’s a big step, and not always the right one to take. Let’s say you need the $10,000 to expand your lemonade stand, but you don’t have any rich friends, you don’t like the bank’s interest rates, and you weren’t impressed with any of the VC firms you met. Instead, you decide to raise the money $1 at a time by selling tiny slivers of the company – shares – to anyone who wants one. Any Average Joe can buy a $1 share of your company. You get the dollar; they get a small slice of ownership. How small? You get to decide, with some limitations. Every IPO is underwritten by a banking institution of some sort, though usually not the same sort of bank that has ATMs. (Think Goldman Sachs, Credit Suisse, JP Morgan, etc.) You and your bankers get to decide on a valuation, and yours is set at $35,000, a 2x multiple of your earnings. If you want each share to sell for $1, then they’re obviously worth 1/35,000th of your company. On the other hand, if you feel like offering $100 shares, each one will entitle the bearer to 1/350th of your company. You get the idea. The share price you set is completely arbitrary, and it has nothing to do with the ultimate valuation of your business. Berkshire Hathaway has famously high-priced shares (over $300,000 per share currently), while other companies have shares trading for well under a dollar (often called “penny stocks”). While there’s some prestige associated with expensive shares, the only number that really matters is the total valuation, not the individual share price. Besides, you get to set the price only once, on opening day. After that, it’s all out of your hands. The day of your IPO is exactly that: the initial public offering, or the first day your shares go on sale to the public. From 9:00 AM that morning onwards, the stock market takes over and you have (almost) no control over the share price. That’s the good news and the bad news. It’s also where we take a break from this and leave the rest of the gory details for another week.